Books and Photo Frame - 6" paper-pieced quilt block pattern. Bookshelf 1 - 6" paper-pieced quilt block pattern. Bookshelf 2 - 6" paper-pieced quilt block pattern. Bookshelf 3 - 6" paper-pieced quilt block pattern. Book Stack - 6" paper-pieced quilt block pattern. Box House - 6" paper-pieced quilt block pattern. 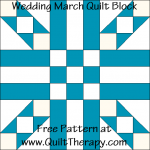 All of the Quilt Blocks Below (and many more) can be found at the"Quilted Kitchen Quilt Blocks" link below the header at Quilt Therapy . 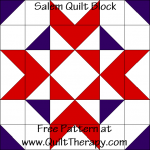 They include a free 12" quilt block pattern, cutting instructions and a diagram. 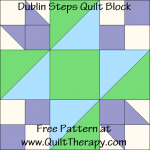 As well as a free recipe that corresponds with each quilt block that is posted. Butterfly - 6" paper-pieced quilt block pattern. Carrot - 6" paper-pieced quilt block pattern. Castle - 6" paper-pieced quilt block pattern. Chinese Lantern - 6" paper-pieced quilt block pattern. Crimson Rambler - 6" paper-pieced quilt block pattern. Gone Camping - 6" paper-pieced quilt block pattern. Flying Geese Kitty - 6" paper-pieced quilt block pattern. 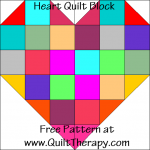 Heart Cat - 6" paper-pieced quilt block pattern. Heart Strings - 6" paper-pieced quilt block pattern. Iowa Star - 8" paper-pieced quilt block pattern. Lamp - 6" paper-pieced quilt block pattern. Mason Jar - 6" paper-pieced quilt block pattern. Mug - 6" paper-pieced quilt block pattern. North Dakota - 12" paper-pieced quilt block pattern. Our House - 6" paper-pieced quilt block pattern. Pinwheel Cat - 6" paper-pieced quilt block pattern. Pretty Kitty - 6" paper-pieced quilt block pattern. Purse - 6" paper-pieced quilt block pattern. Sharp Dressed Cat - 6" paper-pieced quilt block pattern. Striped Tree - 6" paper-pieced quilt block pattern. Sundress Kitty - 6" paper-pieced quilt block pattern. Tree - 2", 3", 4", 5", and 6" paper-pieced quilt block pattern. Tree 2 - 6" paper-pieced quilt block pattern. V-Neck Kitty - 6" paper-pieced quilt block pattern. Watermelon Cat - 6" paper-pieced quilt block pattern. 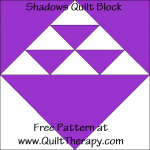 All of the Quilt Blocks Below (and many more) can be found at the"On Cloud Nine" link below the header at Quilt Therapy . 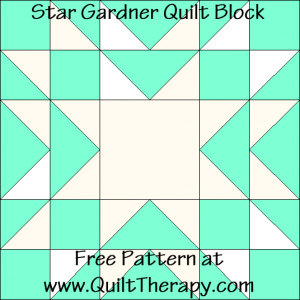 They include a free 12" quilt block pattern, cutting instructions and a diagram. Alabama - 18" pieced quilt block pattern. Arizona - 12" pieced quilt block pattern. California - 12" pieced quilt block pattern. 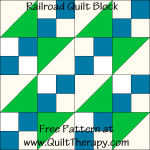 Chain Link - 12" pieced quilt block pattern. 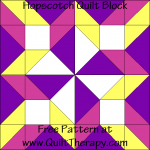 Chisholm Trail - 12" pieced quilt block pattern. 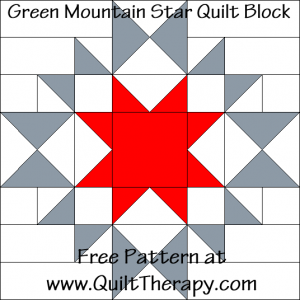 Christmas Star - 10" pieced quilt block pattern. 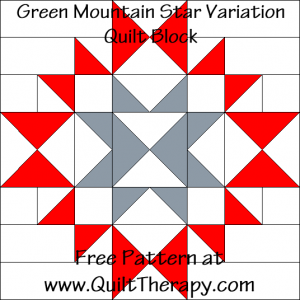 Colorado Beauty - 12" pieced quilt block pattern. Crockett Cabin - 12" pieced quilt block pattern. Crown of Thorns - 18" pieced quilt block pattern. 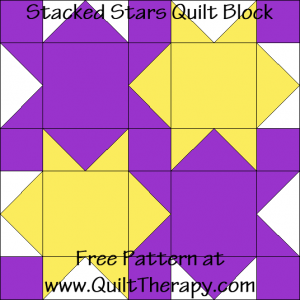 All of the Quilt Blocks Below (and many more) can be Found on the"Star Power Quilt Blocks" Link below the Header at Quilt Therapy . 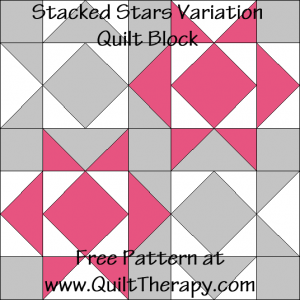 All "Star Power Quilt Blocks" are shown in pairs. An original design and a variation of the original design. 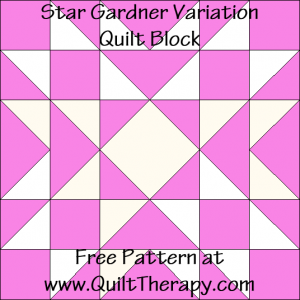 The instructions include free 12" quilt block patterns, cutting instructions and a diagram for both sets of quilt blocks. Hawaii - 12" pieced quilt block pattern. Indiana Puzzle - 12" pieced quilt block pattern. Lady of the Lake - 12" pieced quilt block pattern. Kansas Troubles - 16" pieced quilt block pattern. Kentucky Patch - 12" pieced quilt block pattern. Love Me, Love My Cat - 6" applique quilt block pattern. Roly-Poly Kitty - 6" applique quilt block pattern. Kitty Trio- redwork embroidery quilt block pattern. 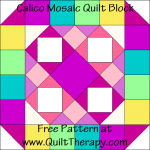 If You'd Like More Free Quilt Block Patterns, Visit Quilt Therapy!